You will probably want to learn how to make sausage if you raise your own pork. Even if you do not raise pigs, maybe you like to hunt for deer or other wild animals so learning about making sausage would be of benefit. Sausage can be made from all types of meat or even a mixture. Sausage can be made loose, what we call bulk sausage or it can be made in various sizes of links. Sausage can also be made with all kinds of different cuts ground from these different animals. For instance, you can grind the liver and the brains into the sausage mixture which will change the flavor and texture some. Some people do use all these parts but I do not. My family always used the other parts like liver in other recipes like the piggy pudding. The process of hog butchering and preserving was passed on in our family. We all learned how to make sausage by using all the scraps containing no skin, gristle or bones. You do want the sausage to have some fat in it for flavor; one part of fat for each two parts of lean meat. If you want to learn how to make sausage, let me just say it is like mixing a meatloaf. You mix a lot of ground meat with other ingredients. The difference I found is my meatloaf is that it so much smaller than the pounds of sausage I make which uses a lot of mussels in the mixing. Another difference in making sausage versus meat loaf is that sausage is best when it has a little time to cure. The curing allows time for the meat to blend the flavors of the spices and for all the ingredients to process. If you are learning how to make sausage, after selecting what types and cuts of meat you will be using, the next step is the grinding of the meat. You can grind it very fine or coarser; this is a matter of personal choice. Most butchers prefer the lightly spiced and flavored sausage to have a finer grind. This grind allows the light seasoning to penetrate the meat. For highly spicy seasoned sausage, most prefer a coarser grind which prevents the meat from being overwhelmed with the seasoning. If you are learning how to make sausage, the next decision to make, or maybe you already have made it, is whether to have bulk sausage or to stuff it in links. If you want to learn how to make sausage in the links, you will need casings. The best and easiest way is to buy them at a specialty butcher or most will order them for you. These are natural intestines which have been prepares for this purpose. They are sold by the yard and in different diameters. Lamb and pork casings are thinner and are more suitable to smaller stuffed sausages requiring less cooking time. 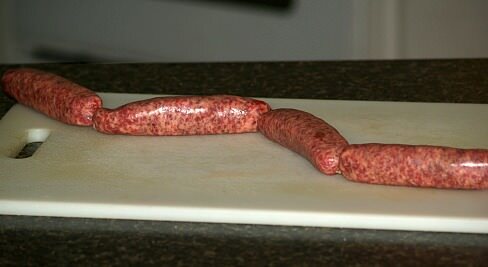 The beef casings are stronger and suitable for the larger sausages. Combine in a large bowl rabbit meat, salt, sage, pepper, nutmeg, cinnamon; mix well. Coarsely grind mixture in small batches; stir in apples. Shape mixture into 16 patties; 3 inches each; cook over medium heat for 5 minutes on each side. Using a coarse disk, grind the pork in a large bowl; using a fine disk grind the beef and add to pork. Add water, milk, salt, sugar, paprika, pepper, garlic, marjoram, thyme, celery, coriander, nutmeg and ascorbic acid; mix well. Stuff the casings with the mixture and tie off into 8 to 10 inch links; cure in refrigerator for 24 hours. Smoke sausages at about 185 degrees for two hours; heat a pot of water to 165F degrees and simmer sausages for 30 minutes. Place sausages in a kettle of cool water for 30 minutes; dry and store in refrigerator for up to 2 weeks or freeze. Coarsely grind all meat; mix in remaining ingredients. Shape into meat patties or stuff in casings. Coarsely grind all ingredients and mix well; stuff in larger casings. Grind meat with a medium disk; grind onion and garlic with a fine disk. Use as bulk sausage or stuff in natural casings. Combine and blend well all ingredients in a large bowl. Use as a bulk sausage or stuff in small casings. 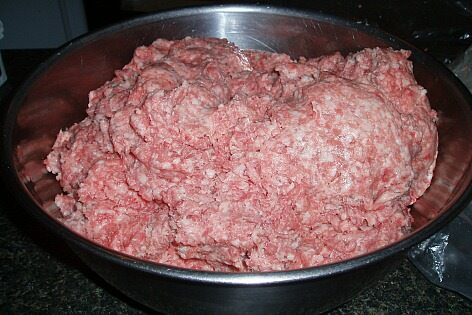 Coarsely grind all meat together in a large bowl; finely grind onion and add to bowl. Stuff in casings; smoke with fruit wood or mesquite for 12 hours until sausages are firm. In a bowl combine sausage, egg and bread crumbs and mix well; shape into 1 ½ inch balls. Place balls on a broiler pan; bake for 4 minutes. TURN OVEN TO BROIL; broil meatballs 2 to 4 minutes. Place meatballs on layers of paper towels to drain. In a saucepan combine chili sauce, garlic powder, brown sugar, vinegar, soy sauce and butter; simmer for 5 minutes. Add meatballs to the saucepan and simmer for 15 minutes; serve hot. In large bowl combine sausage, egg, bread crumbs and sage; shape into 24 balls. Slowly brown on all sides; combine remaining ingredients and pour over meatballs. Learn how to make sausage flavored with sage. Trim skin and fat from pork roast; cut pork into chunks. Grin chunks in food grinder; stir in sage and remaining ingredients. To cook shape into patties and brown on both sides. NOTE: The flavor gets better if covered and placed in refrigerator. I divide it into smaller portions and freeze.